A calzone (Italian "stocking" or "trouser" or "drooping sack" or "hanging fold") is a savory turnover that originates from Italy. 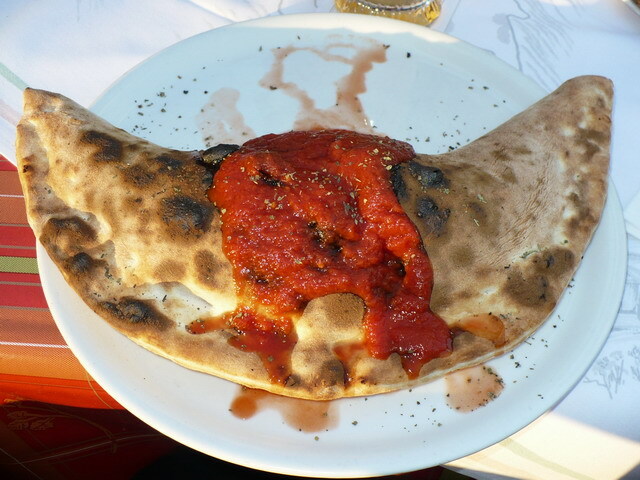 It is made as a type of pizza folded over and shaped like a crescent before cooked. In the United States, calzone are typically made from pizza dough and stuffed with cheese (usually mozzarella cheese and Ricotta, but some varieties contain Parmesan, Provolone, or a locally substituted cheese), ham or salami, vegetables, or a variety of other stuffings. It often contains an egg, the yolk of which should be runny. It is typically served with marinara sauce on the side for dipping, or topped with garlic and parsley infused olive oil. The dough is folded over, sealed on one edge, salted, then baked. Calzones are similar to stromboli, but traditionally the two are distinct dishes. Although most strombolis are rolled, strombolis have also been known to be prepared like a calzone, where the only difference is that a stromboli has the sauce inside of the folded crust, where the calzone is served with dipping sauce on the side. The ingredients for both of these types of pizza are at the discretion of the chef.